When I was covering snowboarding in Colorado, the X Games and the Vans Triple Crown were always held up as the pinnacle events on the professional calendar. Now that I’m a Vermonter, I know better. The 26th annual U.S. Open of Snowboarding is ongoing this week at Stratton. All the big guns are there — White, Teter, Clark, Kass. The same riders compete in the X Games and Vans Triple Crown as well, but the Vermont event has something those contests can never touch: history. The U.S. Open is the oldest snowboarding event in the country, starting in 1982 at Suicide Six. Back then, the Snurfer was prominently involved. The event is a source of pride for locals and is an industry party of the highest order. 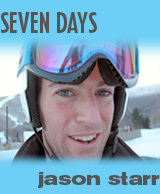 I have not made it to Stratton on my ’07/’08 tour of Vermont resorts yet, and this week will be the perfect opportunity. Part festival, part snowboard industry convention and all elite competition, the U.S. Open will be abuzz through Sunday. BIG OOPS. Thanks you ... the correction has been made.